Hasbro’s classic 50-year-old Easy-Bake oven is losing its light bulb in its 11th re-design. The new, bigger, sleeker purple Easy-Bake Ultimate Oven costs $49.99, up from $29.99, just in time for the holiday shopping season. The oven, recommended for children ages 8 and up with required parental supervision, now heats cookies and cakes like a traditional oven, according to the Associated Press. Hasbro, based in Pawtucket, R.I., says the temperature in the new model can reach about 375 degrees while the exterior is warm when touched. 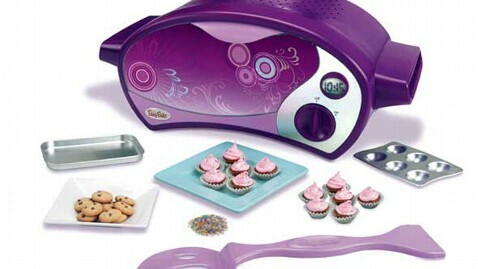 First launched in 1963, the Easy-Bake oven formerly relied on a 100-watt light bulb to bake goodies. As efficient LED lamps and fluorescent lamps push aside traditional incandescent light bulbs, Hasbro decided to makeover the classic toy. The company said the new oven meets all safety regulations. Almost 1 million ovens were recalled when Hasbro initiated a voluntary recall in 2007 after reports of children getting their fingers stuck and burned. The Associated Press reports a 5-year-old girl was injured so badly she had to have part of her finger amputated. The new oven no longer has the iconic stove-top pink look, but baked goods still go in one side and out the other when ready. The Ultimate model includes a baking pan, cupcake pan, pan pusher, chocolate chip cookie mix, red velvet cake mix, pink frosting mix, rainbow sugar crystals package, and paper cupcake wraps.